Berlin / Munich, August 9, 2016. Holtzbrinck Digital, the internet investment holding of Holtzbrinck Publishing Group, invests in the online education platform iversity. Thus shortly after filing for insolvency in June the management team successfully managed to bring on a new investor. The investment on the basis of an asset deal allows the team to leave the insolvent company behind and provides it with a long-term financing perspective. Approval by the creditors’ council is still pending, but is generally considered a formality. Going forward iversity will continue to focus on its B2B business. On the one hand, this means building out its public course offering in the field of professional development. On the other, the company will work closely with corporate clients to develop customised solutions meeting specific customer-needs. Christina Pautsch, formerly Director of Product at iversity, will become second managing director besides Hannes Klöpper. 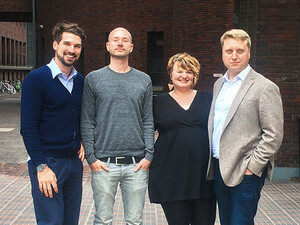 Together with Dr. Florian Nickels-Teske, in charge of Business Development, and Gordon Friebe, in charge of Technology, they make up the four-member founding team. The free courses (MOOCs) currently on the platform can remain there as far as iversity is concerned. The company is engaged in negotiations with a number of parties in order to find ways how an academic course offering can be made sustainable. Part of the new strategy is an exclusive cooperation with Springer Nature, which is part of Holtzbrinck Publishing Group. In collaboration with Springer Nature iversity plans to digital degree programmes. Existing Springer Nature distance education programmes as well as new offerings in the field of professional development will be offered on iversity in a digital format. Moreover the partners plan to experiment with new formats that complement Springer Nature’s existing textbook business. “In 2013 iversity was the first platform globally to offer MOOCs for credit. Working with Springer Nature will allow us to make the important step towards full-degree programmes” explains Christina Pautsch, who leads iversity’s product development. About iversity iversity.org is an education platform that offers online courses in collaboration with universities, companies and NGOs. The company, originally founded in 2011, was the first European platform to offer Massive Open Online Courses (MOOCs) as well as the first platform globally that offered courses awarding ECTS credits. Today iversity has over 750,000 users and more than one million course enrolments. Since entering the B2B business in 2015 a number of blue-chip clients have decided to adopt the iversity corporate learning solution. Additional information: http://iversity.org. About Holtzbrinck Digital Holtzbrinck Digital is the internet investment holding of Holtzbrinck Publishing Group. Holtzbrinck Digital is active internationally and functions as a strategic management holding, actively managing and developing a portfolio high-growth as well market leading online companies. The company is led by Markus Schunk, Michael Hock and Stefan Peters. Additional information: http://holtzbrinckdigital.com.